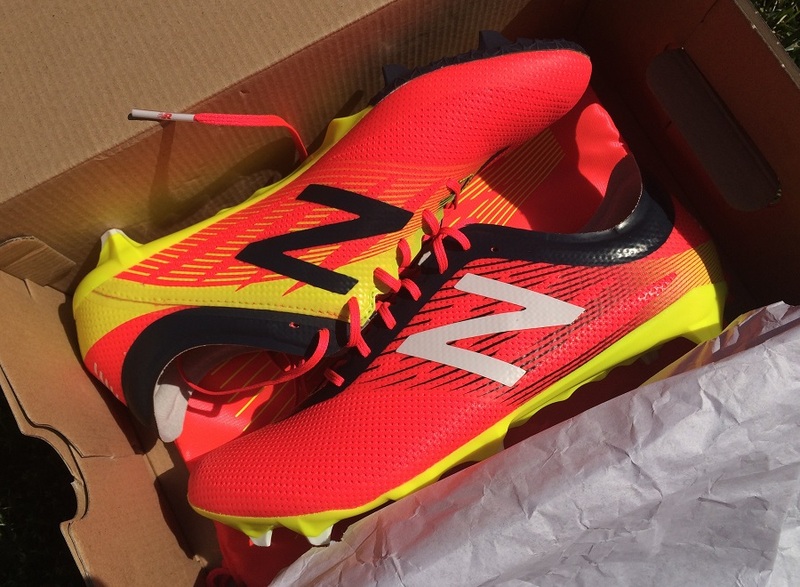 Earlier this month, we were introduced to a highly anticipated release as the New Balance Furon 2 was officially launched to market, and this second edition of their attacking styled boot features some key modifications. Taking into consideration player feedback, the NB team looked to evolve the range and focused on fundamental improvements. How could they take the entry version up a notch and allow players to play more freely? The resulting release includes a new upper material, lacing system and heel cut. 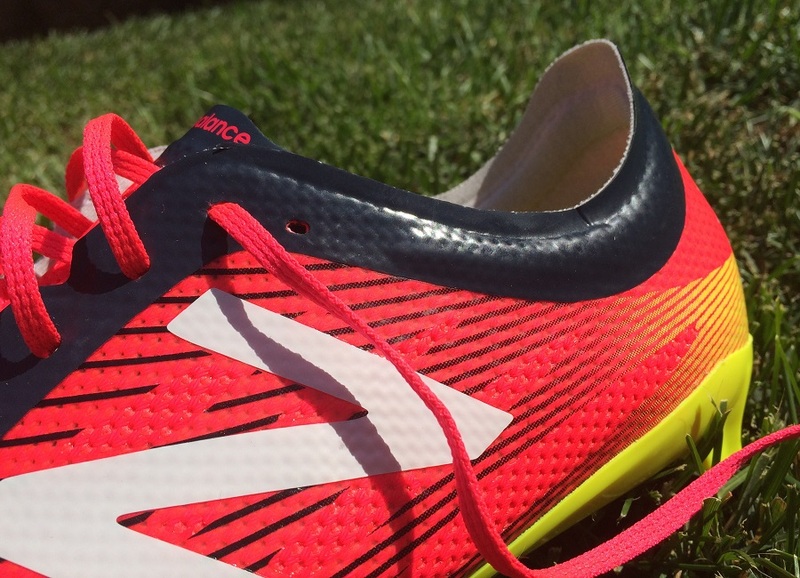 Some areas have been left unchanged, but overall there is a all-new type of performance associated with the Furon 2. One area where NB has continually excelled is in design, and again the visual appearance of these is highly appealing. But improving how they function on-pitch is where it really counts at this time, and that means they also come with heavy expectations. We’ve had them for several weeks and have had plenty of time to assess what is on offer. 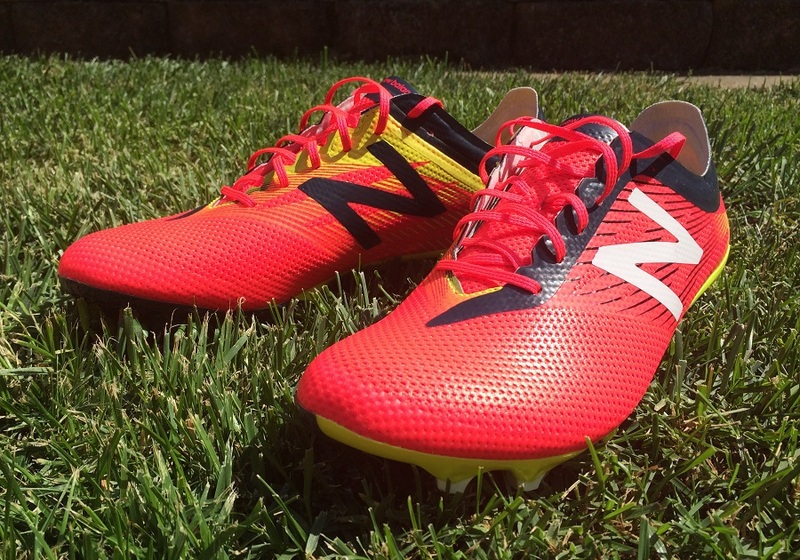 Find the NB Furon 2 available at soccer.com. We have been waiting for this release a while, with plenty of positive chatter surrounding the improved performance of the silo. Visually, they are striking in the best possible way. 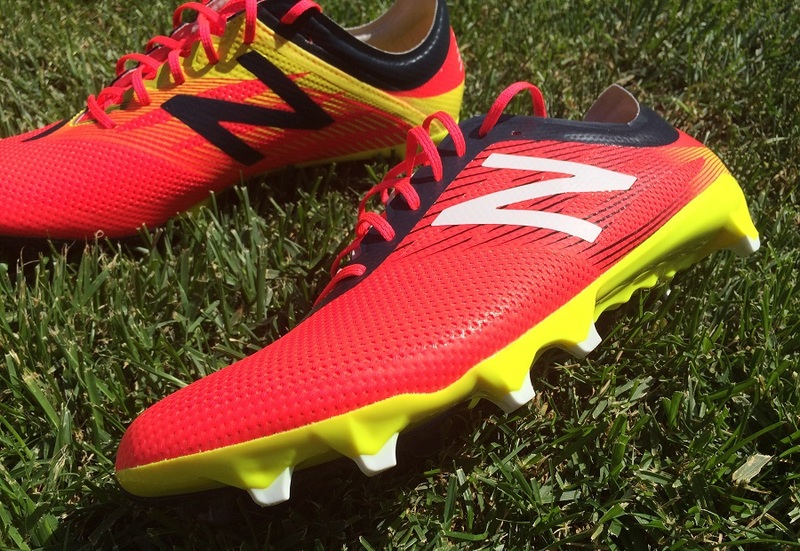 New Balance has again created a boot that captures the imagination. The updates are also key, with a more pliable upper and a released lacing system creating plenty to be encouraged about. Starting out, I’m genuinely hoping performance is on another level compared to the poorly original version. Seeing as it is probably the most important update on the boot, I’ve got to start off by covering the fresh new upper material. 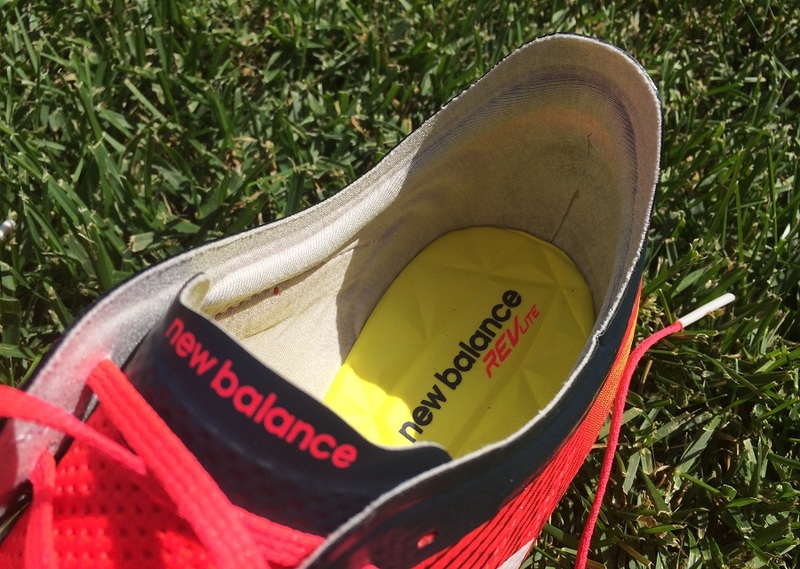 NB has moved to a more pliable Hybrid Mesh material that is essentially a 3-layer system. Right over your foot, you will find the base layer that has the feel of a soft suede, then on top of that is the mesh layer, and sitting outside is a synthetic material (Phantom Fit) that creates an extra level of durability to the upper. To the touch, the material is softer than the original Furon, and it has some texture and tackiness to it thanks to the perforated design of synthetic over mesh. There is definite improvement here without compromising durability even though the upper isn’t as soft as you might expect. There is still a slightly plastic like feel to the material, where it tends to crease in your fingers as you grab it. This helps keep the shape of the boot in check right through wear but it has positives/negatives performance wise. So, the first few sessions went decently well, although I’m still not won over by the comfort provided by the Furon silo. That reservation is related to the overall structure of the boot and how it sits across the foot. I’m going to switch direction here and head into the area of fit, something I feel it is relevant to cover. From midfoot to toe, the shape of the boot heads towards the big toe. This means the outer arc from little toe through big toe follows a similar path to some older Puma V-series designs. But where these differ is along the inner side, where the cut is pretty straight, in an odd way. 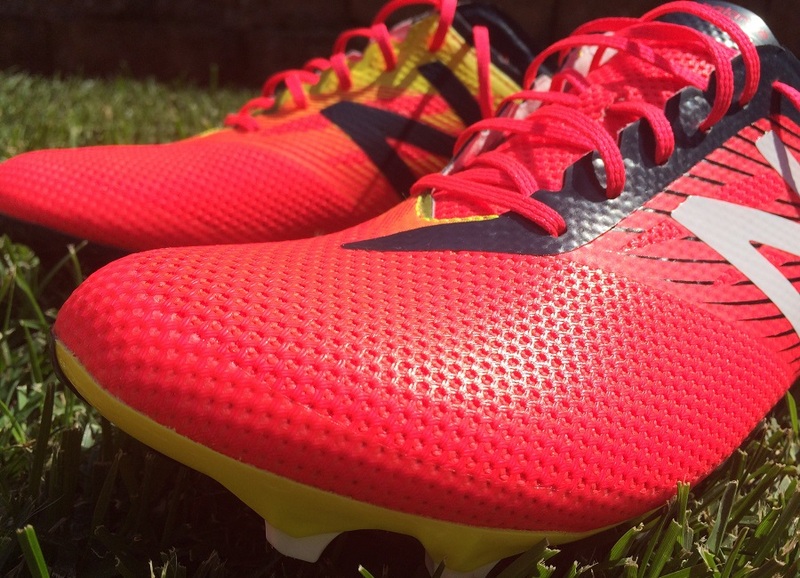 It produces a very different fit to other boots on the market. It feels far more natural than the original, something that is strongly related to what is a more pliable upper material. One thing that really helped from the start was the ability to really loosen up the laces. New Balance introduce a standard style lacing, with the tongue sits freely and unconnected on wither side. By having the opportunity to loosen all the laces, you are able to establish a more natural fit and tightness across the forefoot from first wear. What this all means is that you’ll need a wear or two to adjust to how the boot contours your foot. That is the key take from the break in period. My advice is to break them in slowly, with at least a training session or two under your belt before heading into a game with them. Allowing the materials to loosen up and mold around your feet is sure to improve your overall experience with them. Being that this is an attack minded boot, how they feel while shooting and striking firm shots is vitally important. The upper is padded enough through the 3-layer construction that it provides adequate protection to allow for solid strikes without feeling the full force on top of your foot. Obviously, they are not a power boot but when it comes to striking shots they provide a quality fell. So, as far as the attacking side of the boot goes, they work out really well. Where I’m not convinced is in general feel on the ball. You just don’t get that natural pop as you look to move swiftly across the pitch. 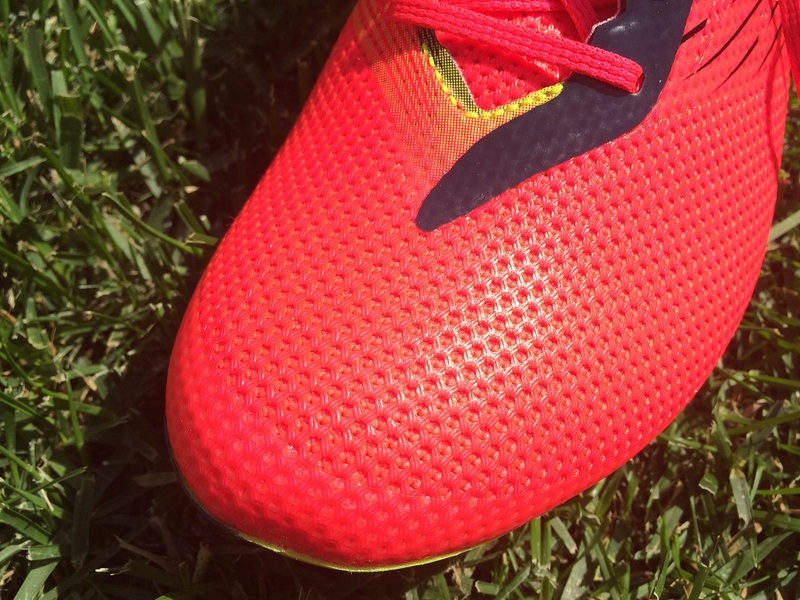 In order to provide extra durability to Furon 2, there is a layer of synthetic across the surface. It has a sticky feel to it that almost proves too grippy as you get touches on the ball. It never really allows the ball to move away from your foot in the natural way you’d expect. I’ve tested this against several other boots to see if there was a noticeable difference and I could tell there definitely was. Listen, it is not something that is going to definitively affect your overall game and in some cases people will appreciate the extra level of control. But as an attacking style boot with speed in mind, allowing the ball to move sufficiently away from the surface is important. 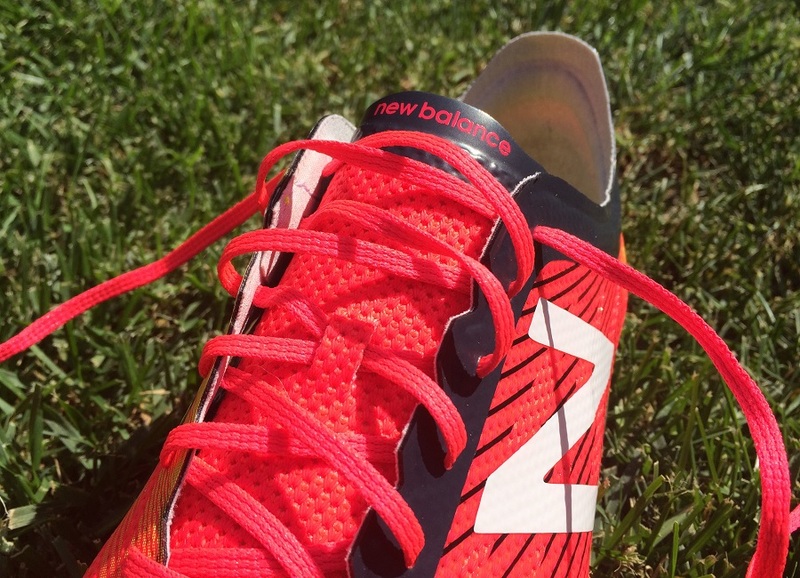 NB has confidence in their soleplate, sticking with the same one found on the original Furon. It offers a futuristic look with a weaving design running through the spine and some oddly shaped studs. A closer inspection of the heel reveals a 2-blade design that is slightly offset, with the outer blade sitting closer to the heel of the soleplate. It is actually quite unusual to look at and it takes a wear or two to adjust to. You can also see in images how the plate has a unique contoured bend through the forefoot, essentially lifting the front blades up off the surface. NB describe the complete system as “Ultra-Directional Studs give unrivaled straight-line speed for those players who have to be first to the ball.” You can see that providing players with the ability to accelerate and move at pace is an important aspect of the boots character. But how does that all play out? In play, one thing quickly becomes clear – these studs are designed to cut into and release from the surface very fast. On FG, that is crucial and on pitches where you can pop through the top surface layer, they prove very effective. You get solid traction and the ability to really release through quick cuts and turns. On AG surfaces, things were just a little bit different especially through lateral movements. I found the system causes some drag on artificial grass, and that proves just a little less effective. 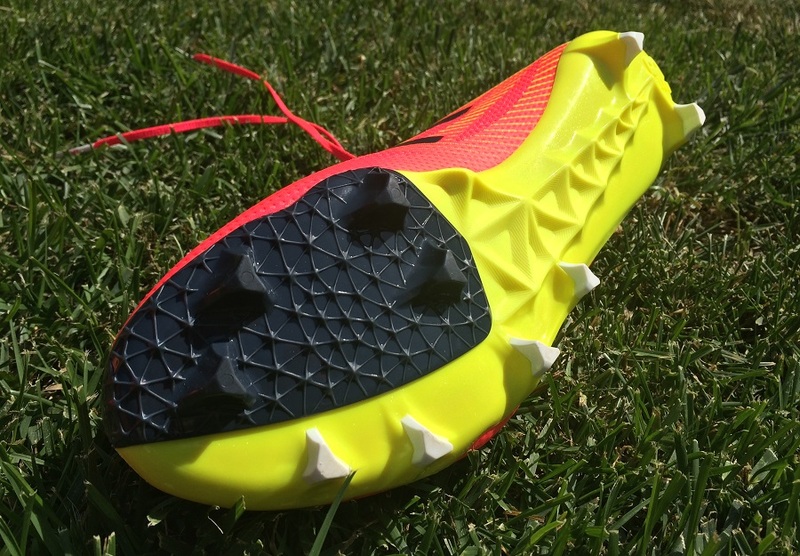 The studs cut the surface but on release you get a sticky feel, sort of like a jarring effect. In summary, I’d recommend them as an FG option but if you play a lot on AG, they might not be as much of a viable option. One interesting addition is a fresh ankle collar lining. The inspiration behind its design comes from running spikes that you’d see track runners wearing. The concept is simple, a little extra padding just below the ankle ball with a thinner layer of material along the cut lining up against your ankle. It is basically the opposite of what you experience with Nike’s mid-cut collars, as the material here moves as your ankle swivels. From a personal perspective, it suits my game. Some will prefer a tighter fit around the ankle but I want there to be just enough protection to keep my ankle in check but allow for a range of natural motions through tight cuts. The slightly tighter padded line offers some additional pressure against your foot to ensure you are still locked into the boot. The actual upper feels like it is made of a stiff wax paper, and trying to get your foot in feels like putting on a swimming fin. The process places you in danger of injury as you wiggle your foot into an almost vacuum like seal. This time around things are better, dramatically better! Described in more detail above, it starts with a more pliable upper and a more effective fit thanks to an open lacing system. You can easily slip your feet into Furon 2 and adjust your fit through tightening the laces as needed. Those changes alone take the boot from an “avoid at all costs” to “you might want to check these out.” So, you can officially put these down as upgraded! In terms of general fit, this is a true to size option with a little extra space to ensure they are a viable option for wider fitting players. The Phantom Fit upper keeps solid structure right across the forefoot, lifting the material just off the surface of your foot. Compared to several other high profile boots on the market, they are definitely more spacious, something a lot of players will appreciate. I normally wear a size 9US and that is the only size I’d want to wear these in. 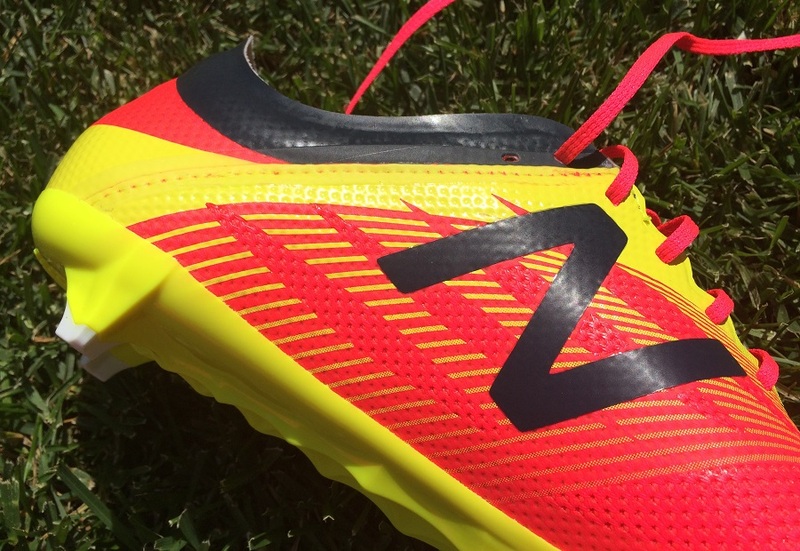 This really is a better release from New Balance, and it takes Furon in a much improved direction. Yet, I still feel like there are areas where this boot can be improved and taken to a whole new level. NB obviously want that to happen, but they just are not there yet. This is an imaginative boot with a lot of positive qualities on offer, and the overall improvements show that with some additional modifications NB can produce a market winner. But, I’m again not won over by this release, they just fall short in too many departments. 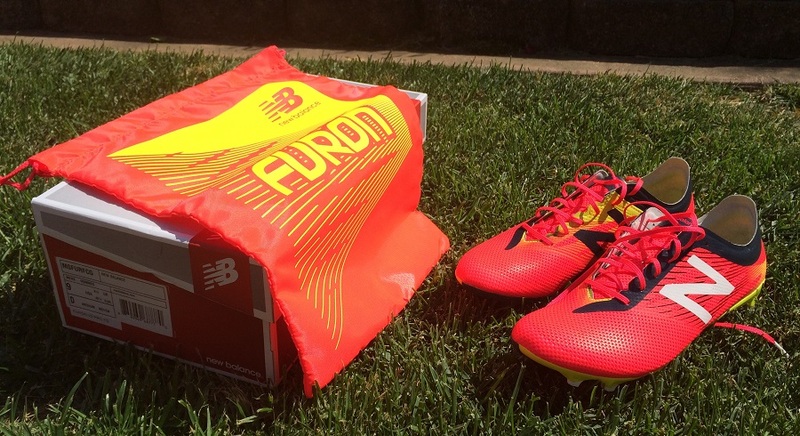 Find the New Balance Furon 2 currently listed at soccer.com. 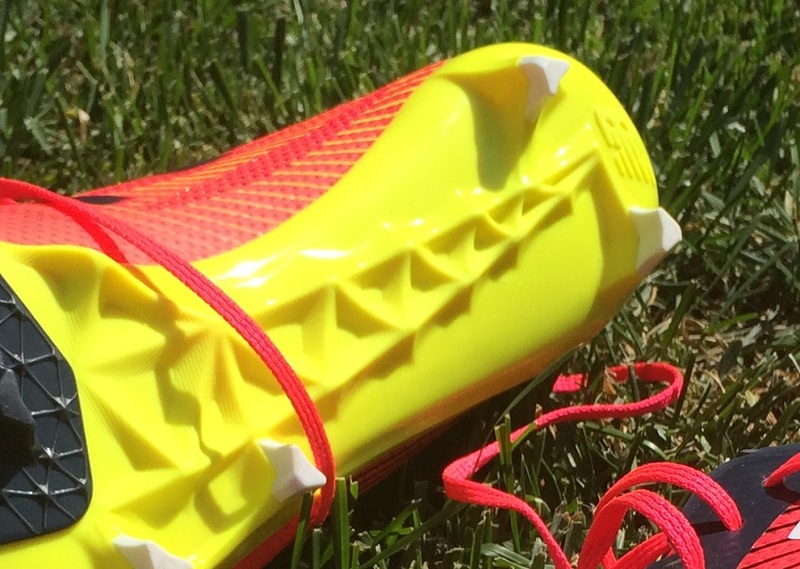 Highlight: A much improved speed boot release that offers a more efficient fit and an ideal upper for striking shots. Would I Buy Them: As much as I’d like to say yes, they just don’t tick all the right boxes for me. BUT, I can see myself recommending them to others as a decent options – especially for anyone looking to check NB out for the first time! Player Position: They are built to be an attacking boot. I see them as much more of a central strikers option than a winger, so players that play done the middle, need some the provides a little pace in small spaces and is an ideal option for striking shots around the box. Interesting update to the Furon. Is the insole removable in these? They have an unusual shape across the forefoot, where it curves towards the toe. So, they are not a standard style fit like other boots. I'd consider the wider fit, but being honest if you can try a pair on before purchasing it with give you the best indication.